Born: 4 August 1854, Pietermaritzburg, South Africa. Died: 10 July 1910, Pretoria, South Africa. 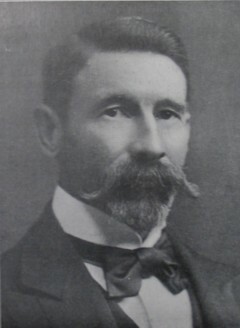 R. Kelsey Loveday, eldest son of George Loveday, a Natal colonist, started working in business at the age of fourteen after a limited school education in Pietermaritzburg. He moved to Pretoria for health reasons and from about 1872 occupied various posts as a clerk in the Transvaal civil service, mainly in the office of the registrar of deeds. After the annexation of the Transvaal by the British in 1877 he was given a temporary appointment in the new administration as registrar of the Transvaal supreme court. During the siege of Pretoria by the Boers in 1880-1881 he served as captain of the Pretoria Rifles. In 1880 he married Augusta Wilhelmina Magdalena Juta, with whom he had six children. After the retrocession of the country in 1881 he was discharged from the public service because of his support for the British. Among other activities he then started to carry out survey work, though he was not a qualified surveyor. In 1883 he compiled his Map of the Lydenburg Gold Fields, South African Republic (Transvaal), on a scale of 1600 Rhineland roods to the inch (c. 1:238 000). Published in London, it was mainly a cadastral map, based on surveys, inspection reports on farms, and other data. As a result of this contribution he was elected a Fellow of the Royal Geographical Society in 1885. In 1889 he compiled a Map of the Murchison Gold Fields. Loveday remained in Pretoria and became one of its leading citizens. From 1891 to 1900 he represented Barberton in the First Volksraad, but did not reside there. He urged the reform of the country's administration and the advancement of education, opposed the government's dynamite concessions, and supported President Kruger's efforts to set aside areas for the protection of game. In 1895 his motion that the area between the Crocodile River in the south and the Sabie River in the north, and between the Lebombo Range in the east and the Drakensberg range in the west, be set aside for game preservation, was adopted by the Volksraad and led to the proclamation of the Sabie Game Reserve (later the Kruger National Park) in 1898. In December 1897 President Kruger appointed him to the temporary management board of Pretoria, on which he served until the town was occupied by the British in June 1900 during the Anglo-Boer War (1899-1902). The military governor of the town then appointed him acting mayor and chairman of the provisional town council. In November 1903 he became an elected member of the city council and served continuously to his death in 1910. From 1903 he also served as a member of the legislative council of the Transvaal Colony, and when representative government was introduced in 1907 he was elected to represent the Barberton constituency in the legislative assembly. During these years he was a member of the land board, the central judicial commission, the inter-colonial council, the railway commission, various commissions of inquiry, and other public bodies. He was a man of complete integrity, tall, well built, and impeccably dressed. Allen, V. Kruger's Pretoria. Cape Town: Balkema, 1971. National Automated Archival Information Retrieval System (NAAIRS). http://www.national.archives.gov.za/naairs.htm Documents relating to Richard Kelsey Lovedale / R. Kelsey Lovedale / R.K. Lovedale.